What's New On A.R. RECORDS !!! To read the biography on each artist, just click on the picture. To hear samples of each project, just click on the title of the songs located below the project that you want to hear. Click here for to get the SPECIAL for both SANCTIFIED CDS for only $28.00 !!! Please go to this link https://www.gospelengine.com/sanctified-harmony/uploaded_audio/albums/all-aboard ..... to hear the new nationally released GOSPEL SINGLE "LOVE ONE ANOTHER" and "I SHALL NOT BE MOVED" from the BRAND NEW CD called "ALL ABOARD" by #1 christian recording artists (on artistopia.com), SANCTIFIED !!!! Leave a comment, let us know what you think and help us spread the word !!! SANCTIFIED was FEATURED is the MARCH of 2009 ISSUE of GOSPEL SYNERGY MAGAZINE !!! SANCTIFIED was FEATURED in the APRIL of 2009 ISSUE of ACAPPELLA TODAY MAGAZINE !!! CLICK HERE TO VISIT THEIR NEW MYSPACE PAGE !!! 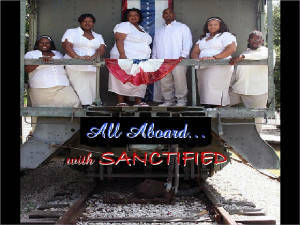 SANCTIFIED-the newest proffessional ensemble on A.R. RECORDS!!! 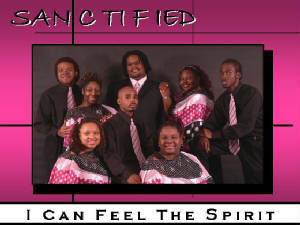 Their newest CD titled "I Can Feel The Spirit" is a wonderful spiritual experience!! 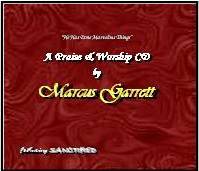 The CD includes traditional songs such as "When The Morning Comes" and songs written by producer and CAMA (Christian Acappella Music Artist) Award winner MARCUS GARRETT such as "There's Just One (church)" and "He Is Worthy" featuring Elder/Minister Sammie Berry of Dallas. This CD is sure to be one of your favorites !! This first solo CD from MARCUS GARRETT has a good up tempo feel to it. Also equipped with different styles of acappella arrangements, this CD is one that you will enjoy. Because of the wonderful voice and production of Gerald "GT" Turner, This CD was nomminated for New Artist of the Year by the CAMA Awards!! This CD was also being played on Gospel radios stations in serveral different states!! Choruses are also singing some of the songs!! You will enjoy arrangements of songs like "Deep In My Heart" and "Show You The Way". Kelvin Alexander's (of the Greenville Ave. church in Richardson, TX) talents also displayed with his writing and also singing the song "Don't Take Your Grace Away". This will be a favorite too!! INSPIRATIONAL VOICES of Dallas West C.O.C. One of the choruses from the Dallas West Church of Christ. Contains songs like the 23rd Psalm, So-to-So (Acappella), It's Amazing, and our own reindition of Amazing Grace. You will love this CD with its mixture olf old and new styles !!! ON SALE NOW FOR ONLY $11.00 !!! Or give us a call at (469) 386-5501. "Experience CHURCH away from CHURCH"
Featuring the songs "He Has Done Marvelous Things" and "Our God, He Is Alive"
"I am listening to the CD right now and I am truly truly enjoying it. It is good singing without all of those sound effects, finger snapping, clapping etc. I can listen to the words and truly understand the song. I especially love the first two songs the most! WONDERFUL, WONDERFUL, WONDERFUL!!! I must commend you on an excellent CD. I will recommend this to many of my church members and friends." If you liked the last Youth Conference Love CD....YOU'LL LOVE THIS ONE !!! A CD with a mixture of choirs AND male groups all on the same CD !! Please support the YCL fundraising efforts by puchasing this CD that is available now and also get YCL Vol. 1 if you don't have it yet !! Thank you for you support.